LCC, the Cookstown-based energy firm, has bought the Cloghan Point oil terminal near Carrickfergus in a multi-million pound deal. The company plans to invest £15m in the facility to accommodate larger tankers of up to 120,000 tonnes' capacity. Currently, most tankers docking in Irish ports are 15,000 to 20,000 tonnes in capacity. LCC said increased capacity "could lead to energy cost savings for businesses and consumers in the future". Cloghan Point Oil has a jetty which stretches more than 1km into Belfast Lough to a point with a depth of 17 metres water draft. 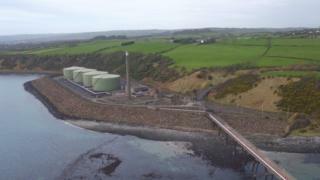 It has been sold by AES, the US energy company which owns Kilroot and Ballylumford power stations. Daniel Loughran, director at LCC Group, said: "We will soon be able to bring in larger tankers from around the world, including the US, the Middle East and South America. "This hasn't been possible to date, so the local market has been limited in where it can source oil. "Being able to dock vessels of this size will bring significant benefits to consumers and industry in the long-run, as the increase in supply logistics and efficiencies should lead to a reduction in price that can be passed on to the end user." LCC also owns an oil terminal at Maydown as well as having interest in electricity and gas distribution and the Go petrol station chain. In 2015 the company made a pre-tax profit of £13.5m on turnover of £544m.